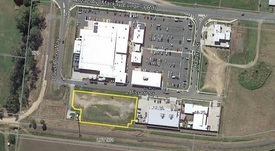 34 Commercial Real Estate and Properties in Mackay And Whitsundays are listed in 6 categories. We have 9 Development Lands for Sale , 9 Industrial Warehouses for Sale , 7 Retail Shops for Sale , 4 Offices for Sale , 4 Hotels and Leisure for Sale and 1 Other Commercial Properties for Sale . Very clean and tidy industrial workshop, with two (2) 4m x 3m roller doors plus private entry door, Office / kitchen area,shower, toilet amenities and large mezzanine. There is also three phase power and onsite parking. The workshop has been freshly painted both inside and outside and is zoned low impact industrial so would have many uses. Would suite a owner occupier or investor. 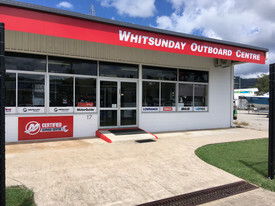 Whitsunday Outboard Centre has been operating in the Whitsundays for over 28 Years and is the Whitsundays Distributor of Mercury Engines and Inflatables, Savage, Stessel and Horizon Boats, Savage Alloy Trailers and Dunbier Alloy and Steel Trailers as well as many other marine chandlery and product suppliers including GME, Lowrance and Simrad. The business is well established, profitable and has a reputation for delivering high class service and products, including all Mercury product, diesel engines, jet skis, ski boats and trailer re builds. 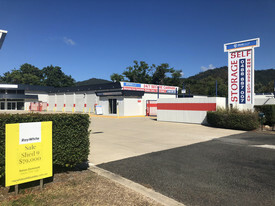 For the last 3 years the business has operated from leased premises at 17 William Murray Drive Cannonvale and a new lease 5 x 5 years is being offered to the incoming owner. The option to buy these premises also exists. The business is being sold as a going concern on walk in walk out basis and includes a store of small second hand spare parts, tools and workshop equipment. New and Used Stock on hand will be valued at cost and is in addition to the purchase price. The sale includes Hyundai Van 2010 that is used as full service mobile van, Holden Colorado 2015 dual cab pickup with tray back and towing to 3500 kg and a Forklift 3.5 ton 2017 diesel. The service team includes (3) three full time mechanics and (1) one apprentice who are experienced and can service all makes and models including Suzuki, Yamaha, Johnson, Honda, etc as well as inboard engines such as Volvo Penta, Westerbeke, Styer, Yanmar, MTU , Nanni , PCM, Indamar, ROLCO and crusader engines. Interested parties will be requested to sign a confidentiality document before the information package and financial statements will be provided. Please phone Brett Dwyer 0447 583 759 for further information. INVESTORS this quality industrial premises is yielding 8.7% net return. The tenant is well established and pays all outgoings. The building is Tilt Slab Construction with Mezzanine Floor, Office , and large Storage / work shop area. With great street frontage and ample car parking this property would suite many uses. Attention investors! This is the one you have been waiting for. After 25 years the time has come to sell this spectacular property located in the best part of the Airlie Beach main street. Current nett income in excess of $300,000 PA 640m2 land with approx 70m2 of frontage 11 tenancies Redevelopment potential to 14m EOI closing March 19th 5pm Contact Mark Beale for further details. This prime development site fronting Shute Harbour Road can be accessed from both Barnes place and Tropic Road. The land area is 15,300 m2 and whilst zoned Low Medium Density Residential may also be re zoned to suite a commercial use by an astute developer or investor. This is a once in a lifetime opportunity and well worth making an enquiry. Vacant Commercial Building - Cannonvale FOR SALE - Offers Conside..
ALL REASONABLE OFFERS WILL BE CONSIDERED Property was built as a commercial bakery and was designed for food handling, cooking and storage. The Building Floor area is approximately 350m2 which is divided into open area cooking and food preparation and separate staff rooms facilities,offices and storage. The sale includes Fridges, freezers, Mixers, Cold rooms, Display Cabinets and more that are still in good working order. The Floor coverings are specifically designed for Food Handling and Food Safety. There is also off street car parking and accessible driveway for deliveries and dispatch. Ideally the property would suite a commercial catering business or any other food preparation facility however it is zoned low impact Industrial and would suite many different uses. FOR SALE Large industrial building 340sqm located Carlo Drive, block construction with roller door access and private entry door,three phase power, own amenities, three exclusive use car parking spaces plus additional common area parking available. Zoned Light Industry this building will suite a variety of uses. Industrial Buildings this size are rare and do not come to the market often. Interested buyers should act now and request an inspection. Business For Sale - Long Established Cafe And Coffee Shop Airlie Beach SALE PRICE REDUCED Now $ ..
SALE PRICE REDUCED! 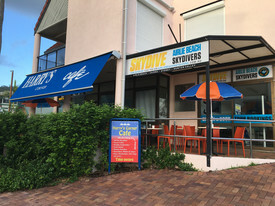 Harry's Corner Cafe and Coffee Shop has been owned and operated by the same owner in Airlie Beach for 20 years and he is now looking to retire.Located on the main street and next to the Airlie Beach lagoon and central car park makes for a constant flow of walk in customers. The business is being sold on a walk in , walk out basis and includes all fridges, stoves, equipment and furniture. Training is being offered and the lease terms and conditions are favourable. The business is presently open for Breakfast and Lunch and closes at 3 pm, 7 days per week. Opportunity exists for new owners to obtain a liquor licence and open for dinner. Financial Statements are available upon request. This will be an ideal storage solution whether you have a business and need the storage space, or just need somewhere to store all the toys. You could also buy and lease out to achieve a rental return on your investment. 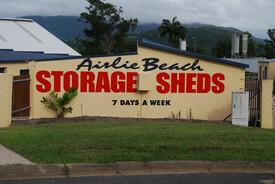 The shed is located in the Portside storage facility, located centrally to Airlie Beach in Jubilee Pocket and with 24 hour access. The 36m2 shed has dimensions of 10.5m long by 3.4m wide, with an average height of 4.5m; and come with power, a wide turning area to access, wash down bay, and all just 2 mins from the Port of Airlie boat ramp. Entry at StoreLocal / On Guard Storage office call for more details today. MASSIVE PRICE REDUCTION NOW LISTED FOR $160,000 STOP paying rent! High Quality Professional Office. 121 Business Centre is well located in the Heart of Cannonvale with high exposure from passing Shute Harbour Road Traffic. The Business Centre is home to Doctors, Dentists, Financial and Taxation Specialist and lots more. This is a great opportunity to purchase your own Office space. 121 Business Centre was Architecturally designed for Professionals and features fully landscaped courtyard and gardens. With plenty of parking for clients and staff this office represents fantastic buying and must be inspected to really appreciate this space.The owner has priced this one low and is keen to Sell. NEW LEASE SIGNED! PRICE REDUCED! REASONABLE OFFERS Considered! Modern Tilt Slab Industrial Unit with Office, Kitchenette, and Mezzanine Storage, Electric Remote controlled Roller Door and Male and Female (including Hand capped) Toilets. Parking and Driveway is concrete and low maintenance. This unit is well located and zoned Low Impact Industry making it suitable for many uses. Would suite investor or owner occupier when lease term expires. Offered for sale by Expression of interest is this 200m2 commercial property with an excellent lease in place and a secure tenant. Offering great corner exposure which will ensure security for future tenancy or a great location for your own business. Information memorandum available on request. 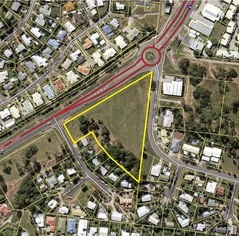 Marian Town Centre - Development Opportunity Contact Des or Cecelia to..
0 BISSETT STREET, MARIAN LAND SITE FOR SALE Site area: 4,227m2 Partially Developed Located in fast developing Mirani Situated in same site area with busy shopping centre Contact Des Besanko on 0429 493 773 or Cecelia Reed on 0437 438 234 of Raine Horne Commercial Mackay today for more information. This site was previously approved for 18 apartments (12 x 2 bedroom apartments and 6 x 3 bedroom apartments). Headworks paid for 18 apartments (approximately $500,000 in value) Previous DA for 36 room motel Level site which is easy to build on All town services available at the boundary Now is the time to secure this centrally located and established site. Sellers are motivated to sell and have priced this site accordingly. Plans and previous DA information available upon request. Call Mark Beale for more details today. This is a great opportunity to buy a leased professional office. Or if your looking to own your own office space then you can move in when the lease expires. Suite 27 is located on the first floor and can be accessed via the elevator or by the stairs. The suite is 76sqm and is Air conditioned , fully carpeted and includes a modern kitchenette. The space is open plan making it very easy to create your own working environment. 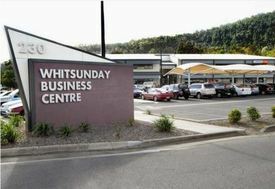 Whitsunday Business Centre is home to many professional businesses including , Accountants Solicitors, Town Planners , Medical, Dentist , Newspaper, Builders, Real Estate Agents, Hair Salon to name a few. With plenty of onsite parking and the Whitsunday Shopping Centre right next door , everything you need to operate a successful business is within close walking distance. Current lease details are available upon request. 2000sqm block of industrial land (40m x 50m) Situated in Cannonvale's industrial hub at Carlo Drive Limited blocks are still available $325,000 Call Mark Beale today on 0404 498 790 for more information. This property has had a massive $550,000 price drop due to the owners needing to move on. 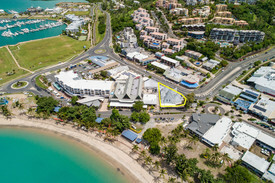 Great buying at this price, it is the perfect opportunity for the astute business person to purchase a well known established business in the Whitsundays. With great access to the main road and exposure to traffic travelling on the Bruce Highway. It is a great business that services local and outer areas. Sale of this property includes WIWO stock, 3 bedroom house, 2 large workshops, Retail shop, storage area, 2 large lockable sheds and much, much more! The site is on a large 10,000sqm site, surrounded by the popular Regatta Waters. For further details, contact Anita Edgar for inspection offers. Development Site - 39 Lots Prime Cannonvale Location For Sale By Expressions O..
Due to the partnership going separate ways this prime 39 Lot DA approved land sub division is now available in the Whitsundays. The centrally located site offers the following opportunity: 39 residential lots Operational Works Approved with costings completed the site is ready to develop. All DA Approved ready to build. Centrally located in the hub of Cannonvale development and growth this exciting subdivision is an excellent opportunity for you to secure now for your future yield. Recent valuation available for genuine buyers upon request. All offers considered make the call today. Balance of existing land estate with 250 lots developed so far Preliminary Masterplan Approval for a further 807 lots Offering includes 6 developed lots providing an opportunity for immediate cash flow 5 minutes to Bowen well positioned between Airlie Beach and Townsville Only Oceanfront land estate in the area Future stages have D.A with next stage 3 OPW drawings completed and ready for lodgement Perfect opportunity for a counter cyclical market acquisition Tony Williams 0411 822 544 Mark Creevey 0408 992 222 approximately This property is being sold without a price therefore a price guide cannot be provided. The website may have filtered the property into a price bracket for website functionality purposes. Very rarely does vacant, commercial zoned lots like this one come onto the market with this much exposure to the main Shute Harbour Road. What a great opportunity to secure one of the last remaining lots with Shute Harbour Road frontage! It is commercially zoned under the new town plan, which is coming out soon. The time is right to secure your future land holding. The additional road visibility to Tropic Road is a bonus. With all town services to your boundary, this is an opportunity you can't afford to miss. This is 607m2 of flat and easy to build on land, so call today for more details. Description: Unparalleled development opportunity 4 Lot Sub Division. Buy 1 or all 4 lots Prime waterfront land ripe for development Three constructed street frontages, situated on Bowen CBD main street Direct access to all necessary infrastructure required Opposite recently completed foreshore esplanade precinct Expansive water views from all areas Position in the heart of Bowen CBD This is a rare opportunity to purchase Water Front Land along the Queensland Coast Contact Exclusive Marketing Agents, Manoli Nicolas, Keir Kreis or Tony Doyle for further details today Site Area: Lot 1: 2,514m2 Lot 2: 2,514m2 Lot 3: 2,514m2 Lot 4: 2,514m2 Total: 2,512 10,048m2 approx Location: Bowen is situated in the most northern region of the Whitsunday Islands in tropical north Queensland. The Whitsunday Islands are a collection of some seventy four continental islands of various sizes off the coast situated between north of Bowen and to the north of Mackay, some 900 kilometres north of the state capital of Brisbane. The Whitsunday Islands are a popular tourist destination for travellers to Queensland and the Great Barrier Reef with the area being one of the most popular yachting destinations in the Southern Hemisphere. Description: Blue Chip tenants on a 3 year x 3 x 3 year options. Started 1/04/2014 . $65,000 + GST per year in rent Rock solid investment Rock solid tenancy Building is all concrete. Display cold room is included as a fixture Property is fully air conditioned and has an excellent central main street position on the main round about in town. OUTGOINGS Paid by owner Rates: $4700 per year Insurance:$3200 per year 10.02 % Gross Return 8.78 % Net Return.. Location: Bowen is situated in the northern region of the Whitsundays on the shores of Edgecumbe Bay, just 40 minutes' drive north from Airlie Beach. It's a picturesque seaside town that offers a beachcomber's paradise with eight award winning, palm fringed beaches to explore. Plus there's the reef, beach and estuary fishing. With a daily average of eight hours of sunshine all through the year, it can also lay claim to having Australia's best climate. Description: Barnacles Backpackers at 16 18 Gordon Street, Bowen, presents a rare opportunity to secure a well performing backpacker's resort in the heart of north Queensland. With the current owners looking to move on from the business after more than eleven years now is the time to purchase this property and take it to the next level, whether it be by a renovation program or through the construction of a further block of rooms (subject to council approval). 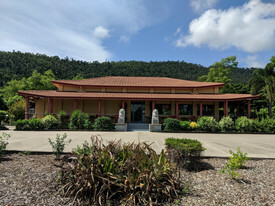 The property would suit an energetic "hands on" couple or family looking to enjoy the lifestyle benefits of owning and operating a business in beautiful north Queensland. Total land area of 4,502 square metres spread across two separate titles; A total of 84 beds on offer, with the option of double rooms, twin rooms, shared dorms or a four bedroom dorm with ensuite; Linen is supplied and there is also a fully equipped guest kitchen and laundry. Bar fridges are available in most rooms; Ample showers and toilets on site; The current owners have a number of key relationships with the reputable major players in the agricultural industries that drive the town of Bowen. Via these relationships the business assists in sourcing work for its guests in the farms surrounding Bowen, whether be fruit picking, sorting or packing; Assessed net maintainable income of $246,329 for the 2014 financial year; With the impending large scale expansion of the nearby Abbot Point Coal Terminal the town of Bowen is expected to boom via a large influx of construction workers and their families; Contact exclusive marketing agent Keir Kreis, for a full information memorandum, historical trading information and contract of sale. Area: Land area: 4,502m2 Location: Barnacles Backpackers is located in the CBD of the north Queensland town of Bowen, approximately 1,150 kilometres north of the state capital Brisbane and approximately 200 kilometres south of Townsville (which is often referred to as the "capital" of north Queensland). Bowen sits on a square peninsula, with ocean to the north, east, and south. On the western side, where the peninsula connects with the mainland, the Don River's alluvial plain provides fertile soil that supports a prosperous farming industry.